While I was preparing for the Layout A Day challenge I’ll be doing in February, I realized that the blog might get neglected. So I’m making a commitment to post my layouts weekly on Fridays and post what’s inspiring me on Mondays. I hope to make other posts as well about creative process and organization and photography, but we’ll see how the cards fall. It’s virus season here and I have three little boys in school and preschool. They bring everything home it seems. If I learned anything last year, it’s that plans change and it helps to be prepared to roll with whatever life throws at you. Went slightly mad on Wednesday and did a (rare) two page spread. 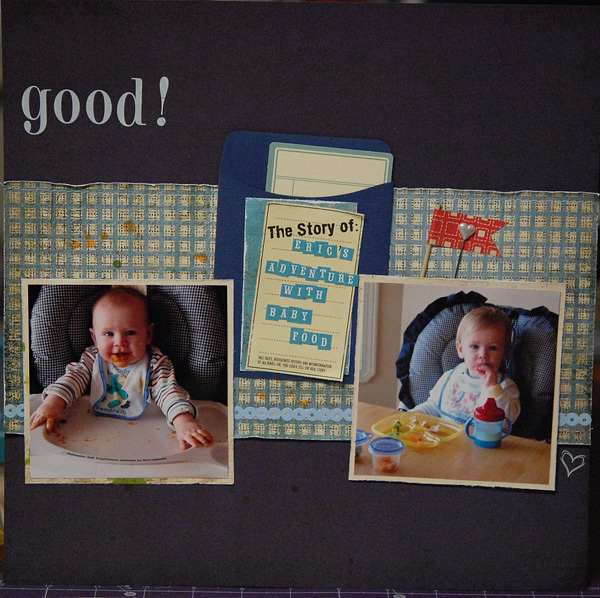 I’ve wanted to scrap these photos of my oldest starting to eat solids for years now. I’m really happy to have these done. For day two I found another ‘old’ photo, this time of my middle boy at around three. I loved his expression in this photo, but always struggled with how to scrap it because the white balance is off. The photo is decidedly yellow. So I tried to counter that with some retro-bright papers from Cosmo Cricket and Crate. These are photos I’ve been wanting to find and scrap for a long time. 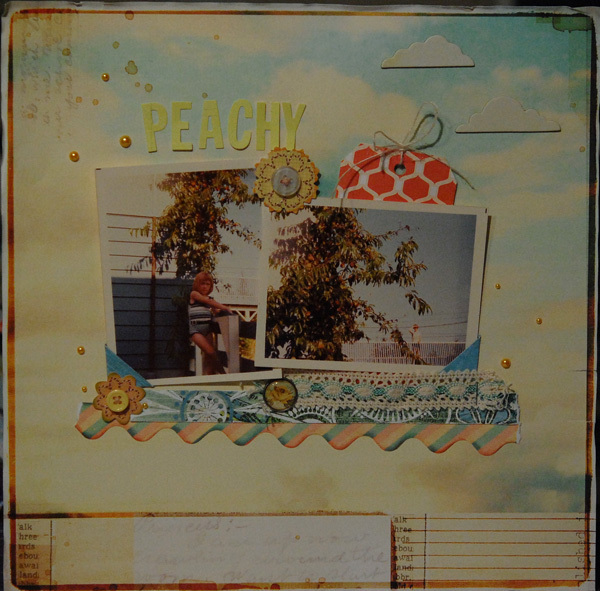 I have very fond memories of the peach tree in our backyard when I was a young child. I remember reaching out of my brothers window to pick a firm, ripe peach. So far, I’m three for three. But I have to admit it’s been a struggle. Not in terms of finding the time or battling perfectionism so much as my creative demons are on the loose. Trying to tear me apart for trying to create daily. Strangely, they don’t attack my layouts, just me. I’m countering them with hugs for my kids and hearing their giggles, ’cause nothing cuts through negativity like a little boy’s giggle and hug.